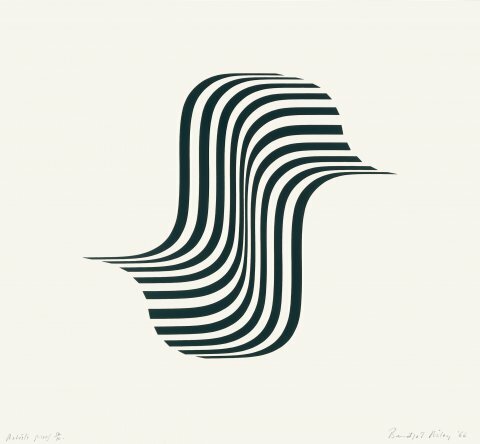 Bridget Riley has become a pioneer of British Op Art with her striking graphic abstract works. Born in South London, she studied at Goldsmiths College and the Royal College of Art. Riley was deeply inspired by an Abstract Expressionist Exhibition at the Tate Gallery London in 1956 through the artists’ liberation of colour, shape and line to their independent values. Riley was the first female artist to represent Britain at the 1968 Venice Biennale. During the 1960s Riley travelled and was influenced by the work of Seurat but it was during her time teaching at Hornsey College of Art that she began to explore using black and white in simple shapes and lines. Alongside artists in the early 60s, Riley strove to create a vision appropriate for new contemporary times, rising out of post-war austerity. 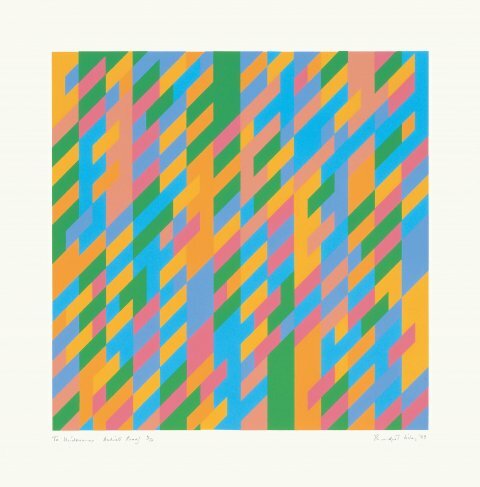 With the introduction of bright colours from around 1967 Riley’s works gained added resonance and a greater sense of movement through optical effects. This can be seen in her ‘Rhomboids’ series in which shifting blocks of varying colours create a sensation of both fluidity and stability. Vibrant colours continue to feature in her paintings and prints, especially following a trip to Egypt during 1980s. 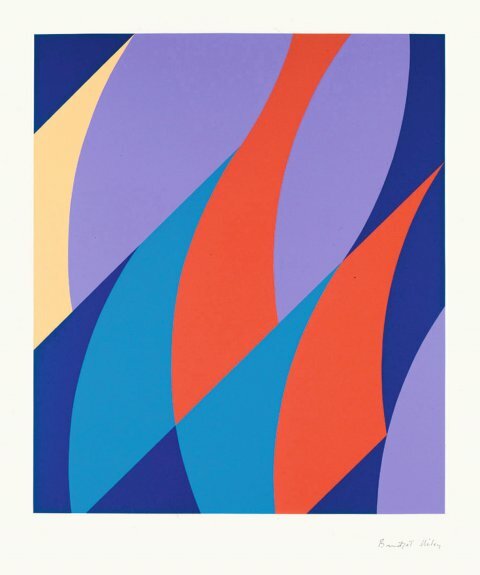 Sims Reed Gallery often holds many striking Riley prints and in February and March 2015 held a large retrospective show specifically dedicated to Riley’s Prints from 1962 – 2015 including works representing the defining styles that punctuate her career. From her black and white 1960’s prints to her radical shift to colour.